Cooking outside has its pleasures. One of those is fresh ingredients and it doesn’t get any fresher than from your own garden! No matter the size of your garden, the satisfaction that comes from cooking with ingredients that you’ve grown yourself is immeasurable. Since we’re renting our current home and we don’t know how long we’ll be here, we didn’t want to put a ton of work into a garden that we may leave in a few years. That and the landlord didn’t want us ripping out a large section of lawn, for some reason. We, my wife and I, decided to get a little box garden. It’s not large, just 5ft x 5ft, cut into quarters, but it’s enough for us to do peas, beans, swiss chard, cherry & yellow pear tomoatoes, zucchini, and some herbs. One issue that we’ve had for the last two years is that the neighborhood cats like to use our box garden as a litter box. NOT COOL! My wife ruled out using the BB Gun, a sweet little Daisy PowerLine 880, so we had to come up with something else. We decided that a non-lethal, non-chemical deterrent would be best and, after searching the internet, we settled on a mosquito net. We built a pvc pipe frame which keeps the netting off of the plants and allows quick access to the garden, while keeping the cats out. Now all we need to do is figure out how to let bees in for pollinating. What do you think? 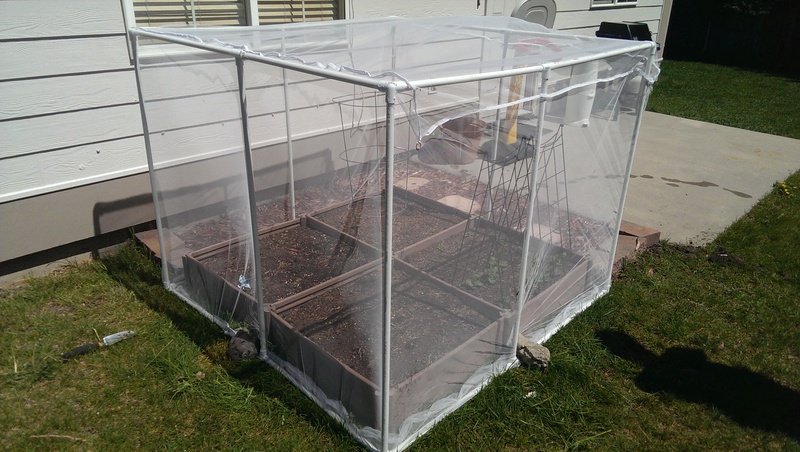 What do you use to keep animals and other pests out of your garden?